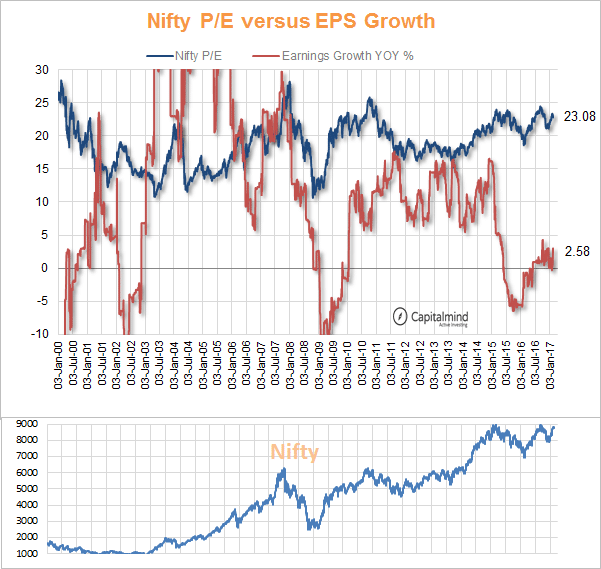 The Nifty has run up a bit, but how high is it in terms of an earnings multiple? And how do returns look from here? If you look at a Price to Earnings Ratio (P/E) independent of anything else, it’s not very useful – because the earnings growth might actually be spectacularly high, or expected to be. But at some point, the P/E becomes useful even as a number – when it’s too high relative to its own history, it might just be a bubble building up. The longer term returns have little data though, since we only have P/E data since 1999, so it’s really been one earnings cycle. Earnings growth as a whole is up just 2.6% but the cycle seems to be turning. The market’s a little hot and it’s not exactly the best time to sell your neighbour’s house and invest. But it’s not super-highly valued either. A further increase in P/E, though, will probably make return probabilities reduce much more. 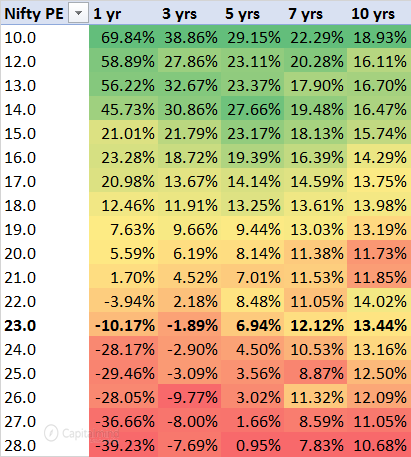 In Capitalmind Premium, we did this analysis with more indexes to see where the broader market P/E is, and how bubbly we seem to be. Do sign up! Use code CM2017 to get a 10% discount.